This month, I am joining Amber’s cut consumerism challenge. This is something that I've been wanting to do for awhile. Having a fashion blog, it’s somewhat expected to a “fresh” look every week. To me, it’s not easy to write interesting content without constantly buying/reviewing new things. I wanted to apologize for not putting good content on this blog for what seems like forever. I am struggling with managing everything in my life right now. I recently took on new responsibilities at work on top of my normal 8-hour work day. Between no shopping and absolutely no free time, blogging has fallen to the bottom of the priority list. I will switch things up a bit and hope to put out good content on this blog soon. Thank you for sticking with me! For this challenge, my goal is to spend less than $100 on clothing and accessory purchases for the entire month of May. Well, guys. I am proud to say that I did it. I only made 2 purchases for the entire month. 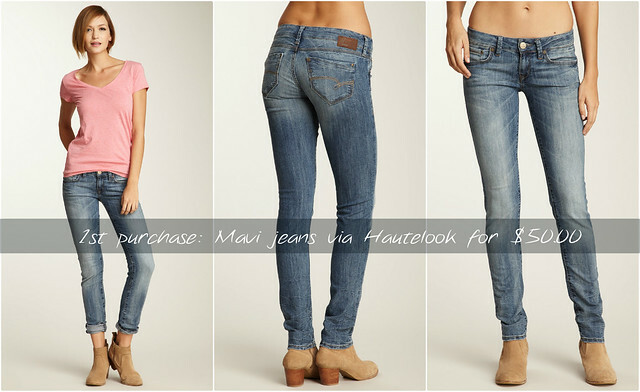 My first purchase was these Mavi Serena low-rise skinnies via Hautelook for $50. Aren't they cute? They will be arriving today. I love the lighter shade denim and hope they fit. My second purchase was this H&M blouse. I am recently drawn to draped blouses. This one is so light and airy. It looks great with jeans, shorts and is appropriate for work if wear correctly. I am sure it will be in heavy rotation this summer. I am going to set the same budget for the month of June. It will be more challenging because I am in need of a few things for my upcoming vacation. We’ll see how it goes. Thanks, Amber for hosting the challenge. My total money spent in May on clothing: $75 (I am pretty darn proud of myself..LOL =). It was tough but I am glad I did it. What a great challenge! I'm so behind on blogs I must have missed Amber's post. Really great picks Sydney - they are staples for sure and you'll get a lot of wear out of them! i feel you sydney. lately i've felt other things to be more important than blogging (gasp) but it's something i enjoy and have missed! you look so chic in that top with the sunnies. good luck with everything in your life - it seems busy but rewarding! Good for you on taking-on the consumerism challenge! I think we all need to evaluate our spending. Hubs and I just did that last night for household budget. It was liberating! Love both purchases you made for May! Sydney, I am so proud of you for this! I know it's hard, especially since shopping also brings forth so much joy. Please don't feel like you need to keep up with the blog for us, because we LOVE your style..whether it is the latest fashion or not. It's your personality and uniqueness that is infused into your blog :) thanks for thinking of us though! You should be proud! It is so hard to keep up a blog and not shop constantly! I'm sure if all fashion bloggers were limited to $100/month, it would be a whole different ballgame. Great job with the challenge! That top is too cute!